On any given day in Tennessee, you might find some form of escaped livestock such as cattle, goats or horses on the road or alongside the road. And of course, deer can be a hazard especially in the fall when they are mating. When animals, especially large ones, suddenly appear in your path, a serious accident can often result. The Department of Motor Vehicles estimates a collision with some form of wildlife occurs every 39 minutes or 1 in every 17 accidents. In fact, 200 motorists die each year from hitting animals and another 10,000 are sent to the hospital. Of course, in reaction to something suddenly appearing in their path, some drivers will swerve to try and miss the animal. All too often, the result is they hit oncoming traffic or they lose control of their vehicle. How to Avoid Car Accidents with Animals? 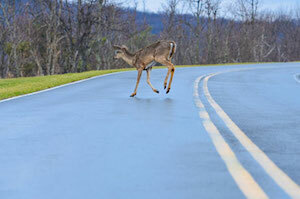 In rural areas particularly, be on the lookout for animals on the roadway. Night is the most dangerous time due to limited sight distance and because a lot of animals are nocturnal. While large animals can invade the occupant space in a collision, typically the most serious injuries and fatalities occur in accidents where a driver has taken evasive action and hit another vehicle or an object like a tree. So mentally remind yourself from time to time to hold your line in the event of the sudden appearance of an animal in your path. Of course, your best protection in a car accident is your seatbelt so always buckle-up and avoid distractions which could reduce precious braking time. Can I Recover Money for Injuries Cause by An Accident with An Animal? It mostly depends on the type of animal you hit. When you hit a wild animal, there is obviously not an animal owner that can be sued. However, if a domestic animal such as a dog, horse, cow, etc. is the cause of your accident, then the animal’s owner may have liability. In addition, you may be able to recover from your own insurance company if you have underinsured or uninsured motorist (UIM/UM) coverage. Recovery of uninsured or underinsured benefits from your own insurance will depend upon the terms of your insurance agreement. At The Law Offices of John Day, P.C. our award-winning attorneys are experienced in handling these types of cases. For example, we obtained a settlement of more than $600,000.00 in a case where our client was driving at night, crested a hill, and collided with a cow in the roadway. If you would like to know whether you have a case, give us a call for a free, no-obligation consultation. We handle all accident cases on a contingency basis so we only get paid if we recover money for you and your family. For more information on fees and expenses, the litigation process and more, visit our FAQs page or give us a call. We have offices conveniently located in Nashville (615-742-4880) or Murfreesboro (615-867-9900). And if you are unable to come to us, we will happily come to you. You can also reach us toll-free at 866.812.8787.